Located in Jefferson County real estate, Imperial MO homes for sale are located within Jefferson County just south of Arnold off of Highway 55. Imperial also borders the neighboring state of Illinois, as well as the majestic Mississippi River in the south St. Louis metropolitan area. Imperial is the perfect suburban town that is only 25 minutes from all the entertainment the bustling city of St. Louis has to offer, while being far enough to enjoy the pleasures of a quieter neighborhood community. Low crime rates and simply fantastic, high-rated schools make Imperial a prime location to raise a family. Imperial MO Real Estate and Imperial MO properties are a perfect addition to the St. Louis Real Estate market. Imperial MO real estate is made up of both established and newly constructed homes. These single family homes offer floorplans with 2 bedroom, 3 bedroom or 4 bedroom options. Homes for sale in Cedar Hill range in price from approximately $25,000 for mobile homes to approximately $550,000. The median home price in 2014 was approximately $180,000. Imperial does boast its own entertainment though being home to the Mastodon State Historic Site and Museum. Not only is this site the home of the Kimmswick Bone Bed, an infamous and extensive collection of ice age of fossils that includes numerous mastodon bones. This park area also features trails and picnic tables for everyone to enjoy while they explore the fossils and ponder the giant mastodons that stood in the exact same spot thousands of years ago. After you explore the park you might want to grab a cold brew at Gators South Beer & Wine Garden, if you can even choose just one from their extensive menu! If instead you are leaning more towards eating, indulge in some legendary Italian fare at Trattoria Guiseppe – a gem that people drive past the infamous Italian grub at St. Louis’ own The Hill for. This town has quite a bit of food and fun for people of all ages. As one can imagine, bordering the Mississippi River also makes for a very fun and scenic time. One can hop on a boat and enjoy all that Missouri’s natural landscape has to offer with its luscious trees and towering cliff sides as you gently float down the river. If you’re interested in learning more about selling a home in Imperial MO or buying a home in Imperial MO, please contact St Louis County real estate expert, Sharon Colona and St. Louis Realty for a professional and simple buying or selling process. Call (636) 397-7653 or email at scolona@stlouisrealty.net. PERFECT TIME TO PURCHASE YOUR NEW HOME WITH A $5000. CREDIT FOR CLOSING AND A HOME WARRANTY TO CLOSE ON OR BEFORE MAY 1ST? Magnificent home with beautiful wood burning Fireplace in the Library. Stunning Beautiful used brick from St. Louis older homes~Covered Porch~Two Story Entry~Library~Dining Room~Main Floor Master Suite~Deck~Up 3 Bedrooms & 2 Full baths~Generator Ready~Handicap Accessible~Observatory to enjoy a Birdseye Fabulous view of the Meramec River pouring into the Mighty Mississippi~Tugboats will light up your home at night as they navigate the ninety-degree bend in the Mississippi River while heading south~New Roof Finished 7/18~Beautiful Eat in Gourmet Kitchen w/Granite~Beautiful Great Room~Over sized 3 car garage~Walk-out ready to finish~Handicap Accessible~This little known secret nestled in Imperial boast a Gated community~Just five minutes from I-55, 15 min to Arnold or Festus and 30 minutes from downtown St. Louis. WELCOME HOME! Spectacular sweeping views & country feel at this one of a kind mini farm. This farm has been modernized with features typically found in highend luxury homes. The custom kitchen will impress your most discerning cook & allow for entertaining, it is central to the floorplan. The main floor luxury master bedroom w/ luxury bath include hard surface flooring, custom modern lighting, glass multi head shower, walk-in closet, custom cabinetry & audio option. Guest rooms are roomy and are all on the upper level or the lower level. Could be a in-law quarters. The barn is equipped with a workshop & additional parking both covered & uncovered. The recently constructed greenhouse is a nice surprise allowing organic growing of plants/veggies. Like fresh eggs? You will enjoy the addition of a chicken coop orchards include: pear trees, apple trees, pecan trees, raised veggie gardens, thorn-less blackberries, fresh asparagus and much more. Raise horses here or simply enjoy the fruits of your farm. NEW PRICE!Beautiful custom ranch home on one acre.Enter to be greeted by an open floor plan, 9 ft ceilings and stained crown molding.The home features newer carpeting and laminate flooring on the main level.The dining room offers a coffered ceiling and bay window.Kitchen with 42 inch cabinets, breakfast bar, walk-in pantry and newer appliances.The breakfast room leads to the the deck where you find a spectacular view of the neighborhood.The spacious laundry/mud room has plenty of cabinets, closet, a tub sink and half bath.Wonderful home to entertain with a family room with fireplace in addition to the living room.Master bedroom suite with his/hers walk-in closets, coffered ceiling, bay window.The luxury master bathroom has jetted tub, separate shower and double bowl vanity.2 additional bedrooms and full bath on the main level.Rear entry 2 car garage.The walk-out basement is unfinished and has rough-in plumbing.There is also a 1 car (8'-6x26') side entry in basement.Come and see today! Welcome to your new life style! Stunning 4 BR 3 1/2 bath former display nestled in a cul de sac on a fenced .42 ac. As you enter into the gracious foyer you'll notice 9 ft ceilings & transom windows throughout the main level. The formal dining rm & den offers crown molding. Kitchen has ceramic tile, breakfast area w/bay that walks out to the patio, Corian counters w/built in sink, custom 42 in. cabinets, island & pantry. You x2019;ll love the main floor laundry w/sink & tons of cabinets. The family room has wood flooring, triple bay window & cozy gas fireplace. All 4 bedrooms are spacious & each have walk in closets. The MA suite is huge w/coffered ceilings & beautiful MA bath w/double adult height sinks, lg shower w/bench and garden tub. The 3&4 BR share a Jack and Jill bath plus a 3rd full hall bath. Experience your own outdoor oasis with a HUGE LAGOON STYLE HEATED INGROUND POOL w/diving board &beautiful covered patio. All this just in time for summer fun! Relax and enjoy! Searching for your own slice of paradise ~ well you have found it in this custom built ranch home nestled on a private 1+ acre lot in tranquil Kneff Farm! The curb appeal will draw you right in to this inviting floor plan designed with entertaining in mind! Unwind in the cozy Great Room with vaulted ceiling & warmed by the wood-burning fireplace. There's plenty of room to impress your guests as you create favorite recipes in the well-designed eat-in kitchen with custom cabinetry, center island & formal dining room. Sip your morning coffee while relaxing in the light, bright sun room or on the expansive patio! Three comfortable bedrooms with a private master suite~ dual-basin vanity, whirlpool tub, separate shower & walk-in closet complete the main level! Convenient interior & garage staircases to the lower level await your finish touches. Additional features: 3 car garage, main floor laundry, 2.5 baths & home warranty. Desirable Seckman schools! Beautiful custom built home on wooded 1+ acre lot with open floor plan and tons of upgrades. This home features a huge kitchen with quartz counter tops, tons of cabinet space and pantry. The breakfast area walks out to a screened in porch that overlooks the private back yard perfect for your morning cup of coffee or relaxing dinner with the family. Kitchen is open to the great room which features a brick fireplace, large 5 window bay, built in book shelves and french doors leading into living room. The first floor also has a formal dinning room, powder room, and main floor laundry/mudroom. The upstairs boasts 4 large bedrooms, the master suite features a coffered ceiling, large bath with separate shower and jet tub, double sink vanity & large closet. The finished lower level has another full bath, rec area, family room, and walks out double doors to the large patio with fire pit and hot tub. Too many upgrades to list, schedule your appointment today. READY FOR APRIL CLOSING/COMPLETION! Welcome to this 2 Story Nottingham Model by McBride and Son Homes. This Open floor plan features 4 bedroom and 2.5 bath. Lots of space for everyday living and entertaining. Three Car Garage, 9Ft Ceilings on First Floor, Window Wall in Family Room, Level 3 Sarsaparilla Aristokraft Cabinets, 42 Tall Kitchen Wall Cabinets, Stainless Steel GE Kitchen Appliances, Open Spindled Railing at Stairway to Upper Level, White Two Panel Doors with Satin Nickel Hardware ,Gray Flannel Oak Faux Wood Laminate Flooring, Adult Height Vanities in Master Bathroom and Powder Room, Chrome Bathroom Plumbing Fixtures, Enclosed Soffit and Fascia, Sump Pump, 3/4 Bath Rough In Basement. hoto images are of former Nottingham Model inventory home. Optional or different features may be shown. Consult with on-site sales for a list of included features. This single family home neighborhood is located in the award winning Fox School District. 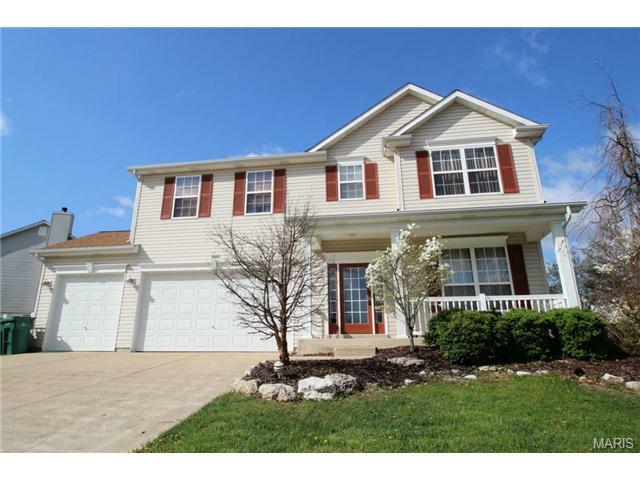 Come check out this gorgeous 2 story home in the popular Amberleigh Woods Subdivision. This 4 year old house has everything you are looking for. The kitchen comes complete with stainless steel appliances, updated lighting, tile back splash, center island, and a walk in pantry. The large family room has beautiful built in bookcases, a stone/brick wood burning fireplace and wiring for a mounted TV over the mantle. The formal dining room has updated lighting and chair railing. Master bedroom suite has vaulted ceilings, walk in closet, and upgraded custom bathroom with double vanity. You will find 3 additional bedrooms on the 2nd floor. The house has dual HVAC sytsems. This house has one of the biggest lots in the neighborhood at .35 acres and has a sprinkler system. The level backyard is completely fenced in, and offers 2 patios for entertaining. The over-sized 3 car garage has its own heating system making it the perfect man cave. The subdivision offers pool, splash pad, and clubhouse. This estate owned home is a real gem, immaculately finished both upstairs and downstairs. Outstanding features include an open floor plan, two master bedrooms, beautiful hardwood floors, stainless steel appliances, recently carpeted and painted, and much more. The main level Master Bath features dual shower heads and pebble tile floor that beautifully accents the custom ordered glass shower. The kitchen features upgraded oversized cabinets and custom bar that matches the beautiful electric fireplace insert of the living room. The main level has beautiful hardwood floors and French door access to a gorgeous deck that runs the entire length of the house. xD; xA; The basement is tastefully finished, and contains a second master bedroom with large walk-in closet, huge family room area, and contains a storage room of nearly 500 square feet. The basement walk-out leads to a nice level back yard and a scenic wooded view. This property offers solitude and should be on your must-see list. New Home in a Hurry! May 2019 completion. The HERMITAGE II model - 4 Bed, 2.5 Bath & 2-Car Garage. This fabulous home back to trees and common ground and has a great view. Cape Cod Grey Siding with Black Shutters, Walkout Basement, 9Ft Ceilings on First Floor, Large Kitchen Island with Breakfast Bar, Stainless Steel GE Kitchen Appliances, 42 Tall Kitchen Wall Cabinets, Walk In Kitchen Pantry, White Six Panel Doors with Satin Nickel Hardware, Gray Flannel Oak Faux Wood Laminate Flooring, Open Stairwell with Half Wall and Stained Stair Cap, Adult Height Vanity in Master Bathroom and Powder Room, Double Sinks in Master Bathroom, Recessed Can Lighting, Enclosed Soffit and Fascia, 3/4 Bath Rough In Basement. You are sure to find yourself comfortably settled at Huntington Glen, as it allows both easy traveling and nearby conveniences. Accessibility and Ease come to mind regarding this location, with its quick access to Interstate 55 and highway 21. This home is under frame and will be move in ready this summer. The popular Westbrook built by Rolwes has the divided bedroom floor plan with 3 beds/2 baths, main floor laundry and a 4' front garage extension on this 3 car garage home. The layout of this home opens to a spacious great room, sunlit dining area and a kitchen that boats SS appliances, gas range, walk in pantry, white kitchen cabinets, granite counter tops and an over sized island with additional seating. This home has many upgrades such as: upgraded engineered flooring, walk out home site, stone wainscoting exterior, vaulted great room and the private owners suite has a large master bath and walk in closet. Rolwes Company includes enclosed soffits and fascia, fully sodded yards and a landscape package. Prepare to be amazed by this gorgeous 2 story home in the sought after subdivision, The Oaks. Walking in you'll be blown away by the beautiful hardwood floors throughout the main level. There's a formal dining room, great room with wood burning fireplace, main floor laundry, and THIS KITCHEN...WOW!! The kitchen features quartz counter tops, including a 7 foot center island, updated cabinets, stainless steel appliances, glass tile backsplash, and a walk in pantry. The breakfast room walks out to an oversized deck overlooking a gorgeous, flat yard that backs to woods. xD; xA; The 2nd floor offers an enormous Master Suite complete with separate soaker tub and shower and double vanity. 2 more generously sized bedrooms, another full bath, and a bonus room. All bedrooms have walk in closets!! xD; xA;The lower level is also mostly finished and walks out to the backyard. This TBB Canterbury is the top of the line in our ranch style floor plans from Rolwes Company. This home offers a split 3 bedroom floor plan with 2 bathrooms, main floor laundry/mud room and a 3 car garage. The lay out of this home opens to a spacious great room, sunlit dining area and kitchen that includes an oversized island with additional seating and a super-sized walk in pantry. The owners suite is the perfect retreat featuring a private owners bathroom and a large walk in closet. Rolwes Company includes enclosed soffits and fascia, fully sodded yards and a landscape package. Showings begin 4/13. Looking for a newly constructed home, but don't want to wait!? This ranch home was just completed at the end of March and has never been lived in by the owners! It's MOVE-IN READY and available for a fast closing if needed! The spacious great room houses a gas fireplace with stunning marble surround and opens nicely to the breakfast room and kitchen. Enjoy a large kitchen with shaker style white cabinets, subway tile backsplash, oversized stainless steel sink, Stainless appliances including gas range w/ hood, plus 2 pantries! There's a convenient main floor laundry rm that leads to the 2-car garage. The master bedroom has a walk in closet and ensuite bathrm w/ soaking tub, separate shower, linen closet and wide vanity. The walk out lower level has a roughed-in bath, full egress window, sump pit & pump and is ready for your finishing touches. Outside you'll find charming curb appeal, patio and lovely yard that backs to trees! Sodded yard will be installed soon. No show till March 1st. 3 bedroom 3.5 bath ranch located on a private 5 acre lot. Walking up you will love the sprawling covered front porch. Inside the open floor plan features a great room with a vaulted ceiling, floor-to ceiling stone fireplace and atrium doors that walk out to a private deck that backs to woods. Entertain family & friends comfortably with the large dining room that features a vaulted ceiling & a convenient breakfast bar connecting to the adjacent kitchen. Retire in style to the spacious master suite that includes a large walk-in closet, atrium walk-out to the deck & private full bath with double vanity. The 3rd bedroom also includes a vaulted ceiling & atrium walk-out. The finished walk-out LL adds tremendously to your living space with a huge family room, 3 bonus rooms & a full bath. Enjoy effortless parking with the 2-car oversized garage + 2 car carport & plenty of off-street parking. Stunning 4 bedroom, 2.5 bathroom 2 story located on cul-de-sac with over 2100 sq ft of living space and room to grow! New Roof, dual zoned HVAC system, exquisite 5 planked handscraped engineered wood flooring sprawling across the main floor. White kitchen cabinetry with Brushed Nickel hardware, center island, stainless steel appliances, pantry and great views of the fully fenced back yard. Main floor boasts an open floor plan with natural lighting, crown molding, and 5.5 baseboards, updated lighting fixtures. Main floor powder room remodeled with new vanity, flooring and fixtures. Upper level landing is graced by a 6' picture window with wood floors continuing through the upper hallways. 16'x11' Master Suite bedroom with spectacular views, walk-in closet, master bath with dual sink vanity. Front and rear Outdoor living spaces, perfect for entertaining. Walk out lower level.